The message sums up my ethos and the spirit of this company. It’s the reason I founded Gem in 2013, back in the early days of the decentralized movement. I believe that every person on this planet is valuable. The technological revolution of the past two decades has resulted in massive improvements in people’s lives. But it has also resulted in a huge shift in the economy and the elimination of entire industries, and with it, jobs. But in the decentralized movement evolving rapidly today, everyone has something to contribute to their larger community. Today, as we stand on the cusp of the New Economy, we have an opportunity to reshape how value is captured, shared and exchanged so that it rewards the people creating that value, and not institutions and their middlemen. That’s what this decentralized movement is about. In the New Economy, everyone is a Gem. Since our founding over four years ago, our culture and core philosophy has attracted some of the brightest blockchain and cryptocurrency engineers and software architects to join the company on our mission to solve the most difficult technology problems in the blockchain space. Together, we’ve designed high-security wallets for cryptocurrency startups. We built the first hardware wallet designed for high-throughput data centers. We also built one of the first enterprise blockchain platforms for large businesses that has won us high-profile customers, including Philips, Capital One, Tieto, Toyota, and other Fortune 500 companies. Now, I’m thrilled to report that Gem is launching a new product this summer that will target the next billion cryptocurrency consumers entering the distributed economy. The largest distributed market in the world today is cryptocurrency. It’s a market that we here at Gem are intimately familiar with, not just as blockchain experts, but as crypto investors ourselves. This is a product that is very close to our hearts. It’s something I’ve long planned to build and I’m very happy that it has come to fruition. 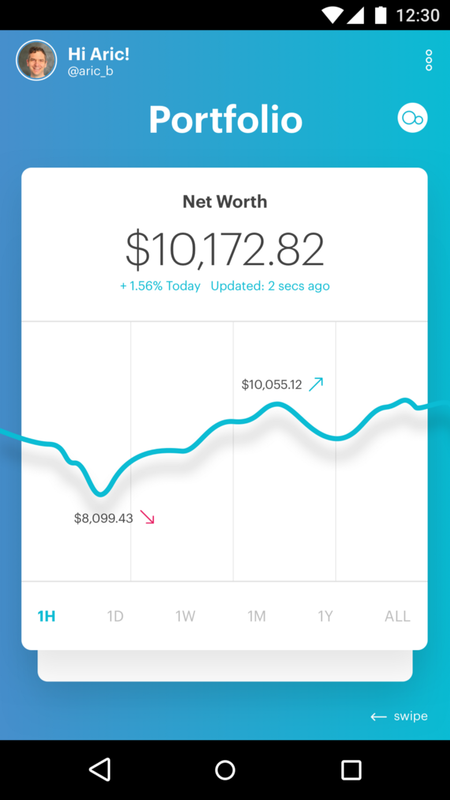 Our new people-friendly and design-rich cryptocurrency platform gives you a single entry point for connecting and tracking all of your crypto investments and net worth, a universal secure wallet to hold and trade all of your assets, curated discovery of new tokens to make informed investment decisions, and a connection to the larger crypto community that is driving the decentralized movement forward. Those are the four pillars of our platform. My goals for this new product are two-fold, one practical, the other lofty and far reaching. The immediate practical goal is to address some of the biggest pain points confronting cryptocurrency investors today. Despite the popularity of cryptocurrency, the user experience challenges are undeniable as the industry grapples with how to make the leap from early adopters and speculators to mainstream users and how to build products that combine practical utility with a beautiful design and rich user experience. At Gem, we want to bridge that divide. We want to give you all the tools you need in one place to really understand what you are investing in and, most importantly, to make the whole interaction more human so that you can confidently navigate the decentralized economy. The platform will begin rolling out with the industry’s most connected cryptocurrency portfolio, which will launch in private beta in May. (Sign up for the beta waitlist here.) We’re taking the simplicity and person-centric approach that products like Mint and Personal Capital brought to personal finances, and applying it to your crypto portfolio. The Gem portfolio connects to a multitude of cryptocurrency exchanges through automated APIs to provide you with a single entry point for tracking all of your crypto investments and your net worth. At launch, the portfolio will integrate with 22 of the most popular cryptocurrency exchanges, and we’ll be adding more quickly based on user demand. You’ll also be able to manually track tokens held outside exchanges offline, such as in hardware wallets. Gem is also creating a universal token wallet that’s designed to make it dead simple for you to securely store, send, receive and trade cryptocurrencies of any kind, all with a key that you control. We firmly believe that you should be able to take control of your own money, and you shouldn’t have to suffer a major headache in the process. And naturally, everything you hold in your wallet will automatically show up in your portfolio. No more juggling multiple apps. 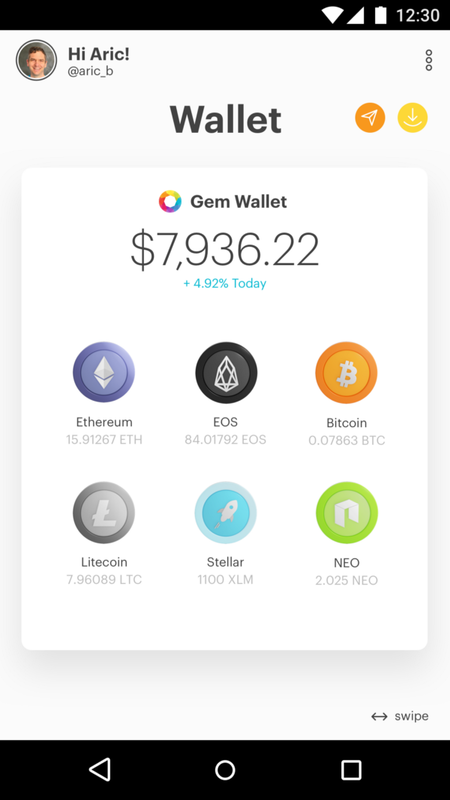 Initially, the Gem wallet will support Bitcoin, Ether and any other ERC-20 tokens. We expect to rapidly add support for other tokens closer to launch. So stay tuned. We’re also creating a discovery tool where you can explore, track, and research more than 1,500 cryptocurrencies to help you discover and learn about the wealth of new projects and communities that are driving this movement forward, and to give you confidence in your investment choices. We also feel strongly that investing in the crypto movement takes a village, so we’ll be rolling out community features over time that help you learn from and contribute knowledge to the entire crypto community. Today, the excitement and enthusiasm around token investing is palpable. But this is only the beginning. For the decentralized movement to truly make the lasting societal impact we all know it can, we will need to grow beyond speculation, and turn these decentralized projects into real, transformational experiences that directly impact the daily lives of the next billion people to join our community. Over the coming months our team will be announcing a series of major expansions to the all-in-one platform that will help drive the industry beyond wealth management and into the next phase of the New Economy, where you’ll directly access and experience a broad range of new distributed apps and services in your daily life. Working on this new product has been a labor of love for me and our entire team. We put you front and center in our hearts and minds, conducting detailed surveys of both beginner and sophisticated investors. We did a rigorous market analysis of more than 100 wallets and portfolio apps, and we relied on detailed consumer feedback to shape the platform. As a staunch believer in personal freedom, cryptocurrency and distributed technology resonates with me in many ways — the redefinition of trust, the efficiency and privacy of peer-to-peer exchange, the focus on individuals over institutions and the aligned incentives of turning users into stakeholders. In the end, though, I believe it’s really just about giving power back to the people where it belongs. We see Gem’s role in this New Economy as your trusted companion on this journey, but you’re in control. We hope to earn your loyalty by consistently delivering our core promise to put power into your hands and craft a delightful and fun experience together along the way. We look forward to your feedback as we roll out our platform this summer, beginning with a private beta of our portfolio manager in May. Sign up for early access at https://gem.co. And finally, this product is being built for you, so we invite you to contribute to the community and get involved. Join our Telegram channel as a community insider and be a part of the movement. Micah Winkelspecht is Founder and CEO of Gem, a Los Angeles-based cryptocurrency startup empowering people to take control of their own wealth and data. An early pioneer in the space, Micah is a thought leader and prolific public speaker about blockchain technology, cryptocurrency, and the decentralized economy. Gem has earned one of the most trusted brands in the blockchain and cryptocurrency industry today serving top-tier clients such as Philips, Mercer, Capital One, and Toyota. Now, with its new user friendly cryptocurrency portfolio, Gem is directly onboarding the next billion consumers into the new decentralized economy. Prior to founding Gem in 2013, Micah spent more than a decade developing software for AT&T Interactive, and for startups Guide Financial (acq. by John Hancock), DialedIn, and Pose. In the games industry, he shipped products for industry giants Activision, Electronic Arts, Atari and 7 Studios (acq. by Activision).